How can get plygon from sprite? Hi, I want to detect collision between two sprites. So, as I understood, it means that I should detect collision between two polygons. 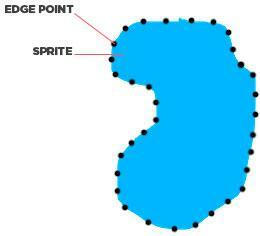 How I can get sprite edge points? Or maybe another way exists? Usually I use https://www.codeandweb.com/physicseditor , load that json to pixi, create special objects that have several polygons inside and containsPoint()/contains() function ( I DONT REMEMBER) that checks every polygon. Its never a plugin or boxed solution because I adjust many things based on the game conditions. Its possible to map file names to content inside "shapes.json" , its very easy. Then you can specify it as a hitArea for sprite or use it as an input for physics engine for physics component of pixi object. Again, pixi doesnt have that in vanilla, it has to be part of your engine on top of pixi.